Most of the Turkic peoples studied, except those in Central Asia, genetically resembled their geographic neighbors, in agreement with the elite dominance model of language expansion. However, western Turkic peoples sampled across West Eurasia shared an excess of long chromosomal tracts that are identical by descent (IBD) with populations from present-day South Siberia and Mongolia (SSM), an area where historians center a series of early Turkic and non-Turkic steppe polities. The observed excess of long chromosomal tracts IBD (> 1cM) between populations from SSM and Turkic peoples across West Eurasia was statistically significant. Finally, we used the ALDER method and inferred admixture dates (~9th–17th centuries) that overlap with the Turkic migrations of the 5th–16th centuries. 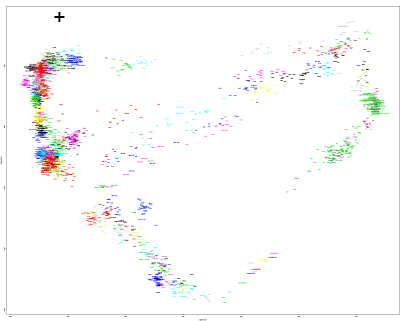 Thus, our results indicate historical admixture among Turkic peoples, and the recent shared ancestry with modern populations in SSM supports one of the hypothesized homelands for their nomadic Turkic and related Mongolic ancestors. However, even tough the paper includes a lot of detail, I still find it somewhat underwhelming. The blame lies with Lazaridis et al. 2013/2014, which really raised the bar for this type of work, using several ancient genomes and very sophisticated techniques to try and unravel the deep ancestry of Europeans (see here and here). It's probably unreasonable of me to expect most population genetics papers to be so thorough, but it's still disappointing when they're not. Also, thanks to Lazaridis et al. as well as a few other recent ancient DNA studies, we now know that the prehistory of Eurasia was more complex than anyone had imagined only a few years ago. Once upon a time is was OK to blame any sort of seemingly eastern genetic signals in Europe on Genghis Khan or Attila the Hun. These days you'd look like a bit of an idiot trying that sort of thing. So yes, in this case the authors probably got it right, and they probably did pick up signals of Turkic migrations from south Siberia and surrounds. But let's wait and see what a good number of ancient genomes reveal about the origins, direction and time frames of population movements across the Eurasian steppe and Taiga belt. Both of these genomes were published earlier this year by Skoglund et al. 2014 (see here). My analysis shows that Ajvide58 is very similar to Mesolithic Swedish forager StoraFörvar11 (see here), and also in part Ancient North Eurasian (ANE). This can be seen in the Principal Component Analysis (PCA) of West Eurasian populations, in which Ajvide58 is shifted east relative to La Brana-1 (which lacks ANE), much like StoraFörvar11. However, the Eurogenes K15 results suggest to me that the level of ANE in Ajvide58 is lower than in StoraFörvar11. That's because Ajvide58 shows less of the Eastern European component (17.54% vs. 23.23%), and none of the South Asian component. These two components, along with the Amerindian component, dominate MA-1's K15 results (see here). On the other hand, Gokhem2 appears not to harbor any ANE ancestry; note it's extreme western shift on the PCA of West Eurasia and complete lack of the Eastern Euro, Amerindian and South Asian components in the Eurogenes K15. This is in line with all scientific literature to date, which indicates that ANE was basically missing from Western and Central Europe during the Mesolithic and Neolithic. Indeed, this sample's best matching population in the Oracle are the Sardinians, one of the few present-day European groups with only a trace amount of ANE. The absence of ANE in Gokhem2 and all other ancient European genomes from a farming context, like Stuttgart and Oetzi, is a very important point. That's because Neolithic farmers largely replaced indigenous hunter-gatherers across most of Europe, including in Scandinavia. As a result, it's probably safe to assume that this process reduced the amount of ANE in Scandinavia to much less than what was carried there by the indigenous foragers (15-19%). However, present-day Scandinavians carry around 17% of ANE, which must mean that there was another migration wave into Northern Europe after the Neolithic, coming from an area rich in ANE. 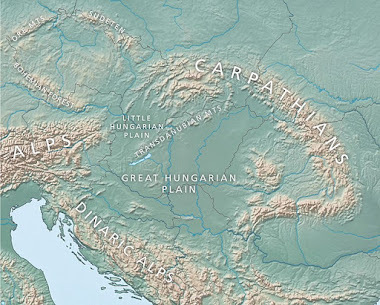 This was probably the Indo-European expansion from the middle Volga region (see here). 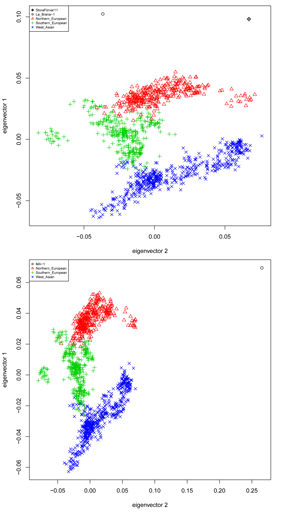 Nevertheless, Gokhem2 does carry forager admixture, which can be seen in its non-trivial levels of Eurogenes K15 components strongly associated with indigenous European forager ancestry: North Sea at 16.74% and Baltic at 3.78%. What this suggests is that the admixture event between the Near Eastern and European ancestors of the TRB farmers didn't take place in Scandinavia, but rather somewhere on the European mainland where ANE wasn't present at the time. Interestingly, the Oracle results are in agreement, because, for instance, they feature La Brana-1 but not Ajvide58. The Eurogenes K15 and Alexandr Burnashev's 4 Ancestors Oracle are available for use free of charge at GEDmatch for anyone with genotype data from 23andMe and similar personal genomics companies. Look for the Ad-mix option and then the Eurogenes tab. StoraFörvar11, or SfF11, is a late Mesolithic genome from a cave on the small island of Stora Karlsö, just off the coast of Gotland. It was published earlier this year by Skoglund et al. 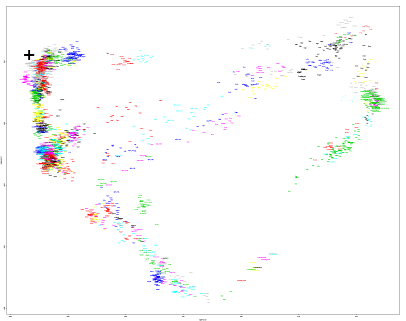 along with several other ancient genomes dating to the Neolithic from Gotland and mainland Sweden (see here). Belonging to Northeast European-specific mitochondrial haplogroup U5a1, SfF11 appears to be the archytypal Scandinavian forager, with no detectable Neolithic farmer admixture but considerable Ancient North Eurasian (ANE) ancestry related to Upper Paleolithic hunter-gatherers from Siberia, such as MA-1 and AG2 (see here). 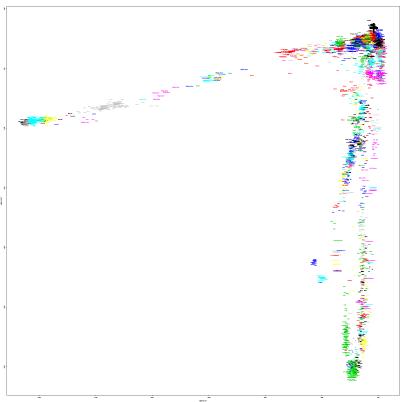 Please note, Sf11 was superimposed onto the first Principal Component Analysis (PCA) plot below, which initially only included La Brana-1, the ancient Mesolithic genome from northern Spain, and present-day West Eurasians. I did this to avoid creating a cluster with the two ancient genomes based not on genuine genetic affinities between them but their relatively poor quality. I obtained the PC coordinates for Sf11 from an almost identical 13K SNP PCA plot which can be seen here. 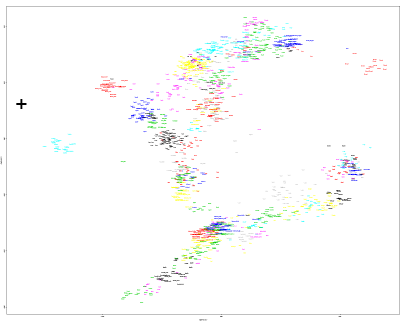 Note also the clear eastern affinity shown by SfF11 relative to La Brana-1, which in all likelihood is the result of the above mentioned shared ANE ancestry with MA-1, featured on the second PCA. To date, all ancient genomes from Western and Central Europe have basically lacked this admixture, while Scandinavian hunter-gatherers carried it at levels of 15-19%. As hypothesized by Lazaridis et al. 2013, it's likely that Eastern European hunter-gatherers harbored even greater levels of ANE, and it's probably a good bet that they introduced it into Scandinavia during and/or before the Mesolithic. Below are the Eurogenes K15 ancestry proportions for SfF11, and below that the 4 Ancestors Oracle results. Even though the K15 test was based on just 8K SNPs, the outcome appears robust, and correlates closely with results from more sophisticated formal mixture tests in scientific literature, in which European hunter-gatherers show a strong relationship to present-day East Baltic populations, especially Lithuanians. Moreover, among the best 4-way Oracle fits for SfF11 is 3/4 La Brana-1 and 1/4 MA-1, which is extremely close to the actual genetic structure of Scandinavian foragers: around 80% Western European Hunter-Gatherer (WHG) and around 20% ANE. The unusually high South and Southeast Asian scores can probably be explained by shared ANE ancestry with South Asians and lack of the so called Basal Eurasian admixture, respectively. Indeed, the latter is a very good bet considering the complete absence of any sort of Mediterranean and Near Eastern signals in these results.